Space per pupil: 315 sq.ft. The new student center on the University’s North Campus houses five major student service amenities: a new recreation and fitness center; athletic offices and rowing team facilities; housing and residential community offices; food service, coffee/café areas; and a lower level storm shelter. The satellite facility accommodates students and staff in the North Bluffs area of campus, and is located adjacent to a new 971-student housing complex. The center is unified by an entry concourse that provides a strong, striking and friendly image, while recreation users are treated to impressive views of the Black Warrior River. 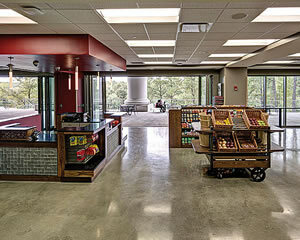 The lounge, adjacent to the “First Year Experience” freshman offices, provides a natural and compelling conclusion for campus tours. The recreation entry is a glassy control point that can be secured from the other building functions, allowing dissimilar scheduling to occur without compromising functionality. The building opens to an outdoor patio that overlooks a wooded park and the River. 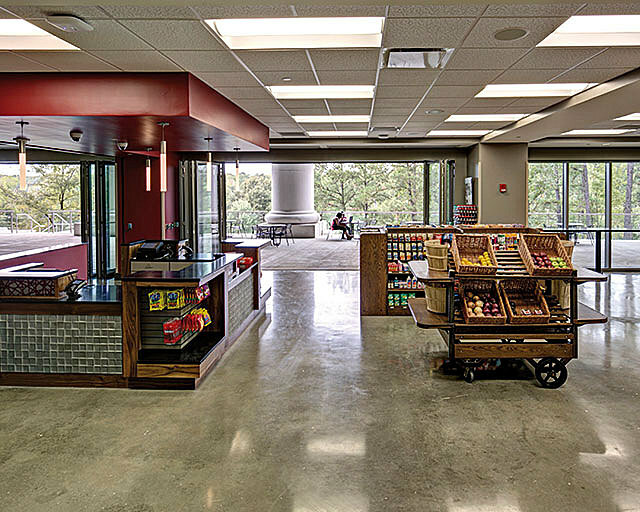 Designers were careful to blend the architectural style with the classic Alabama campus vernacular, using strong 2-story columns as a familiar welcome mat. Inside, the building’s transparency, finishes and furniture offer a clean, fresh, contemporary feel. This transparency reduces reliance on artificial light sources most of the day. 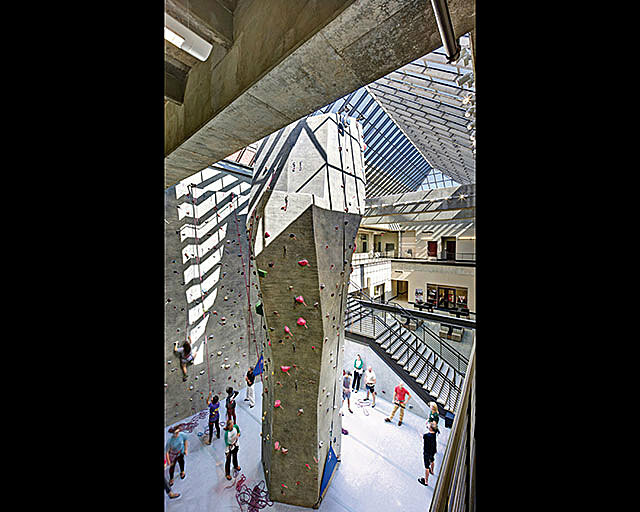 Just inside the entry is a large new climbing wall — a feature meant as an impressive introduction to the center, which rises nearly to the skylight above. 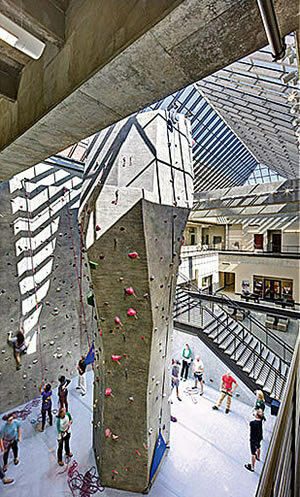 In total, the building adds about 85,000 square feet of recreation space to the university’s capacity. The first and second floors are devoted to strength and cardiovascular training spaces. 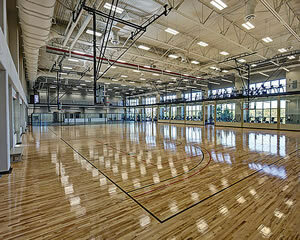 The second floor features three multipurpose courts, with one enclosed to serve as an indoor soccer and uniquely transparent Multi-Purpose Activity Court or “MAC” gym. 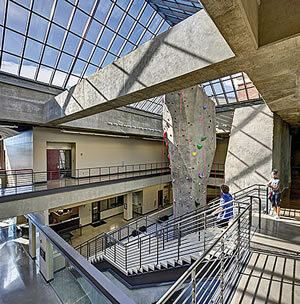 The MAC, which is normally a confined space often found in an enclosed room of floor-to-ceiling cinderblock, is open and exposed at the new center. 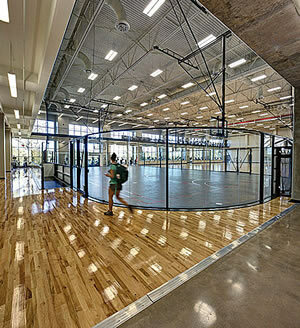 Eight foot tall glass dashers surround most of the synthetic playing surface, which is striped for basketball, hockey and soccer. Convertible goals can be recessed for soccer or utilized for hockey. 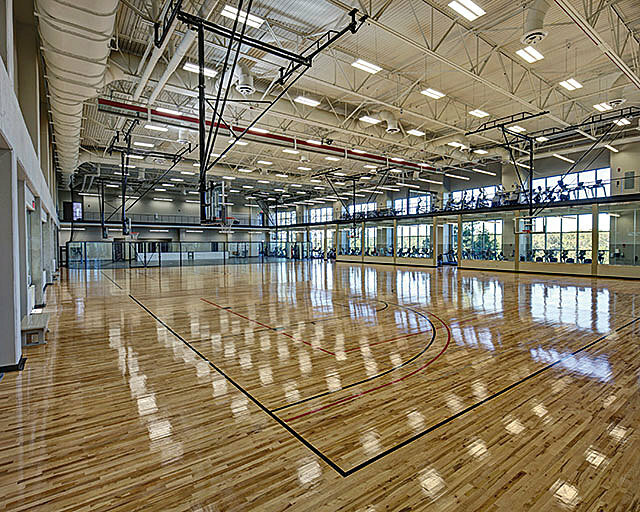 The MAC is situated on the second floor as one of three courts in an otherwise hardwood gym. It’s the first element visitors see as they reach the top of a monumental staircase. In April 2011, a devastating tornado struck Tuscaloosa — narrowly missing the campus. The event served as a wakeup call for university administrators, and inclusion of an area of refuge became an essential element within the new student center. The area serves as an emergency safe haven for students populating the adjacent new residence halls. 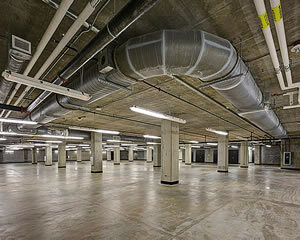 The lower level with separate entry is a FEMA-rated storm shelter capable of housing roughly 3,200 people. In this busy area of campus, this strengthened, reinforced space can house people safely - even in the unlikely event that the upper part of the facility was to collapse. An emergency generator serves the shelter and is provided with dual fuel sources for guaranteed performance. Taking advantage of the natural site contours, the storm shelter was designed for the lowest level of the new center, which creates a large “walk-out basement” that allows students to quickly find shelter during weather events or other emergencies. FEMA standards were referenced during the design phase, calling for additional features such as emergency power with redundant fuel sources, dedicated toilet facilities and storage for supplies and food. Finishes in the shelter area are very basic, with a sealed concrete floor and exposed concrete on the walls and ceiling. Designers responded to the university’s needs for the emergency shelter without compromising its usability for non-emergency programming. 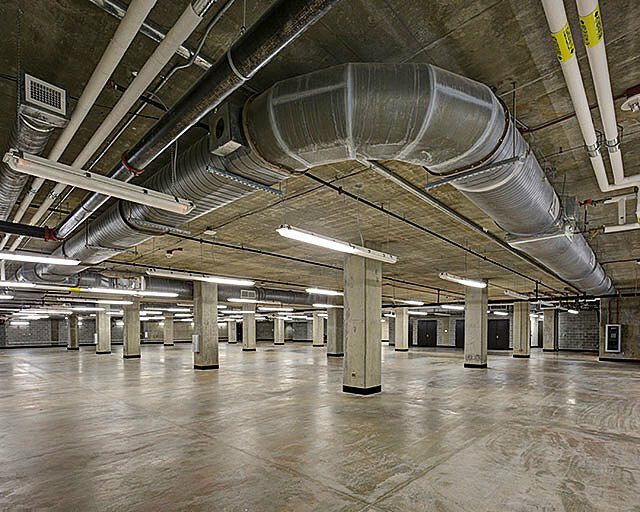 With the hope that the storm shelter will never be needed for this purpose, and in order for alternative use options, dedicated storage rooms were provided to stow equipment used during non-emergency functions. 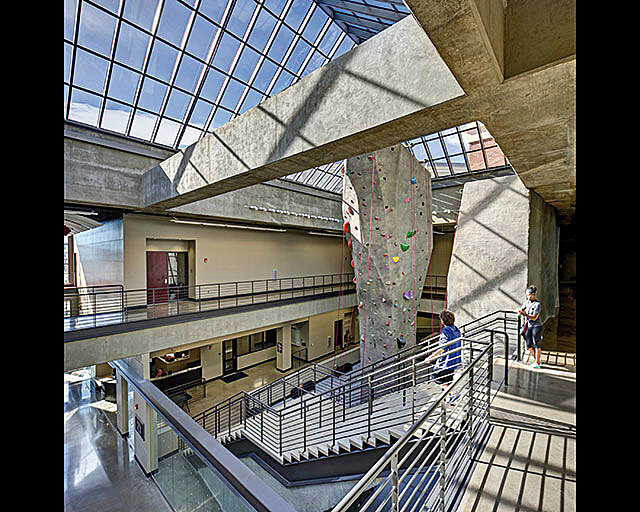 Since no other space of this nature currently exists on campus, the actual use patterns will evolve over time, but anticipated uses include group exercise, specific club sport practices, staff meetings and training, temporary classroom space and lectures — anything that involves a quick set-up and breakdown time. Cast in place concrete is the primary structural system and the primary interior finish. The storm shelter needed to be impervious to tornados, while the gymnasium, located on the upper level, needed to be isolated from the lower level with a very stiff structure to prevent vibration interference for other functions. Concrete provided all the attributes required and was more economical than steel. The site for this project made it necessary to stack the major functions on three levels. The top level is the gym level, the middle level is the primary entry level and the lowest level is the emergency shelter. Although the interior of the facility is very contemporary, the exterior relates quite literally to the campus architectural vocabulary. 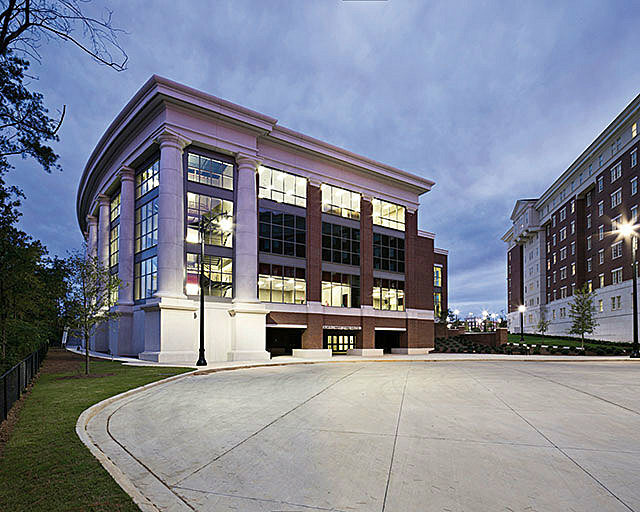 Since the building is on the northern edge of the campus and designated as a signature building, it was essential to use the traditional architectural expression that defines the beautiful Tuscaloosa campus. 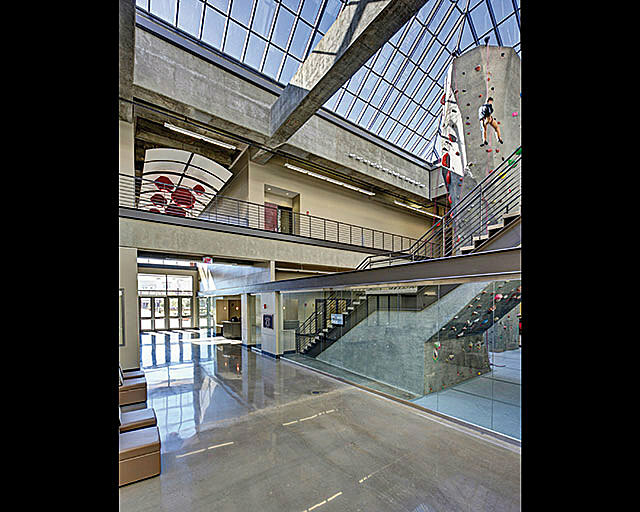 The facility is organized around a central atrium that connects all major functions physically and visually. 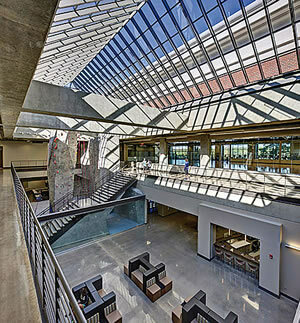 The atrium is part of a free zone that welcomes visitors to campus and serves as the final stop on formal campus tours for prospective students. The facility also houses the First Year Experience (FYE) program, which provides support and resources to freshmen, enhancing student success. The building opens to an outdoor patio that overlooks a wooded park and the Black Warrior River. Natural materials and natural light define the interior aesthetic of this facility. Cast in place concrete is the primary structural system and is the primary interior finish. Accent colors are used to give life and additional visual excitement. 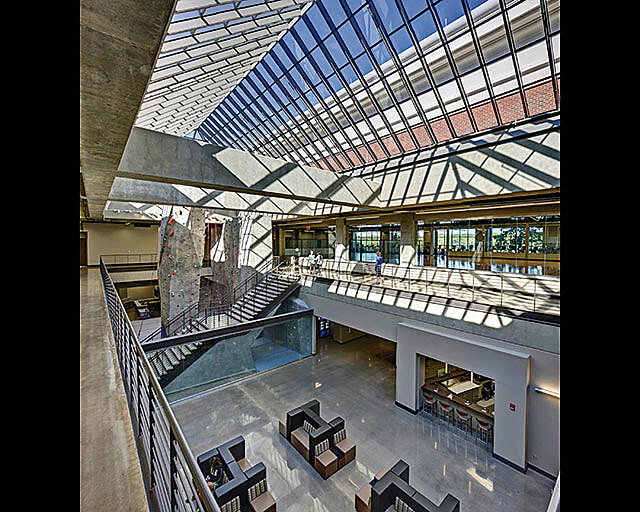 Natural light floods the three-story atrium that orients users and creates visual excitement and a welcoming atmosphere. 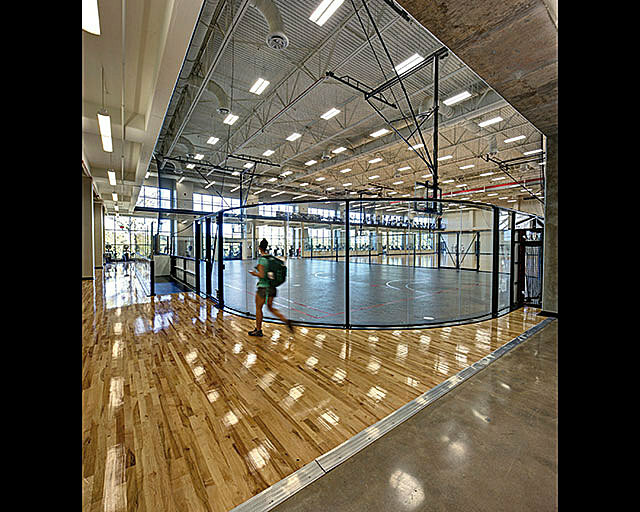 Glass encloses many of the major spaces including the three-court gym. 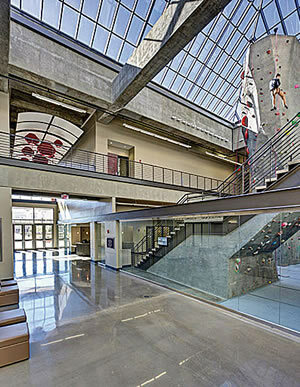 Concrete was a logical and economical choice for this facility. The storm shelter needed to be impervious to tornadoes and the gymnasium, located on the upper level, needed to be isolated from the lower level with a very stiff structure to prevent vibration interference for other functions. Concrete provided all the attributes required and was more economical than equivalent performance in steel structure.